(CNS): Thirty three women took part in the first ever Ride Like A Girl event in Cayman last weekend and rasied over $2000 for the crisis centre. 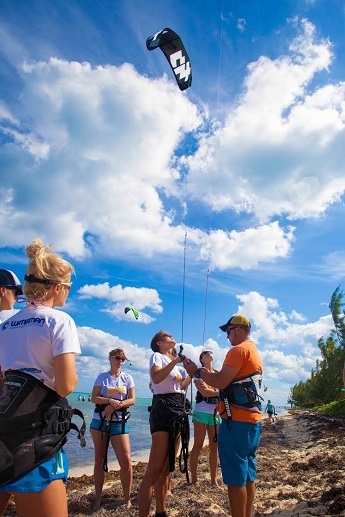 The women’s only watersports challenge as well as being a fundraiser was designed to empower and motivate the participants to overcome any fears they may have of watersports. The group was made up a majority of complete beginners who organisers said showed courage by trying new and intimidating sports while more advanced girls were pushed to new limits under the supervision of local pro’s Maya Lewis, Amy Strzalko and Kiristen Cousins, the event’s founders. The day started out a Barkers National Park with a warm up Yoga session before splitting the event’s participants between the two resident kiteschools, Kitesurf Cayman and Hurricane kiteboarding. Beginners were introduced to the art of kite flying using trainer kites on the sand before advancing to full size inflatable kites in the waters shallows. In the afternoon the women were paddle boarding and wakesurfing. The day wrapped up with a fast and furious couple of hours on board Wakeboard Cayman’s speedboat which took groups of girls out to try Wakesurfing – a relatively new sport to Cayman, which sees participants surfing a wave behind the boat. Maya Lewis, on of Ride Like A Girl founders said she was thrilled to be part of the inspirational event. “Our Ride Like A Girl women gather with the hope of trying something new,” she said. “They left with huge smiles, new learned skills, new friends, a new community of women to ride with and tremendous satisfaction from raising funds for a wonderful local charity.